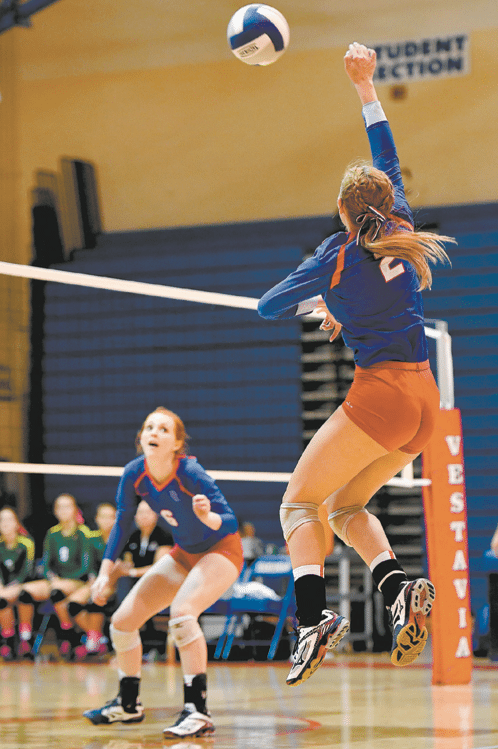 Vestavia Hills Senior Anna Langley (2) is one of three returning starters who lead this year’s team. Journal photo by Lee Walls Jr.
Mandy Burgess returned to Vestavia Hills for her second stint as the head coach of the girls volleyball team last year. She led the team from 1999 to 2012 before hanging up her whistle to focus on her family. When the position opened back up in 2016, she couldn’t fight off the itch to return. During her first stint as head coach, she led the Rebels to a state championship appearance, five final fours, eight area championships and a regional championship in 2003. The year that she “retired,” she was awarded Alabama Coach of the Year by the Alabama Association for Health, Physical Education, Recreation and Dance. She’s now tasked with reimplementing her style of play from scratch. Senior Anna Langley and juniors Mary Quinn Carter and Hannah Vines are returning starters who lead this year’s team, a group that has its sights set on ambitious goals that Burgess believes to be attainable. It’s a young group that is filling the shoes of eight seniors who led the Rebels to the super regional last season. They’ve spent much of the young season traveling to tournaments outside of the area. That included a trip to Siegel High School in Tennessee for the B2B tournament, in which the girls finished 3-2. Among the competition at that tournament were teams from Kentucky, Georgia and Tennessee. They began area play with a win over Tuscaloosa County on Sept. 14. They’ll continue diving deeper into area competition as September rolls into October, and they’ll compete in the Over the Mountain Invitational on Sept. 29-30.